Carved by famous maker, "Romweber" of Indiana for their "Louis XV de Gaulle" collection, this spectacular 9 pc. 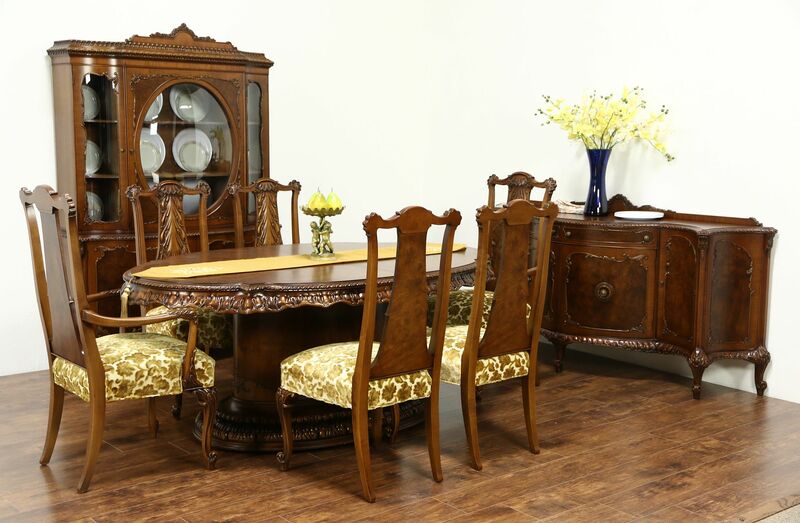 dining set includes a table, six chairs, sideboard and china cabinet. Depicted in their 1942 catalog, this striking design was unique to Romweber, whose furniture was sold to the White House and many celebrities. The restored finish is in excellent condition on acacia and walnut woods with matched burl panels on this American made vintage furniture. Embossed hardware is original. The table has a striking banded matched burl top and oval base plus four 12" wide original leaves with matching skirts or aprons. Measurements are 50" wide, 30" tall, legroom is 26" and length when closed is 74," with all four leaves in place, length is 10' 2" overall. Six richly carved chairs are tight and strong, upholstered in European cut velvet fabric in very fine condition. Two armchairs measure 25" wide, 24" deep, 44" tall and seats are 18" high and 19" deep, four side chairs are 21" wide, 23" deep and 42" tall. The breakfront china display cabinet has a convex porthole window and curved glass doors. Shelves have grooves to display plates if desired. Measurements are 52" wide, 19" deep and 75" tall. The sideboard, server or buffet has a dramatic serpentine front. There are velvet lined silverware drawers with curved fronts. Measurements are 77" wide, 21" deep and 38" tall.